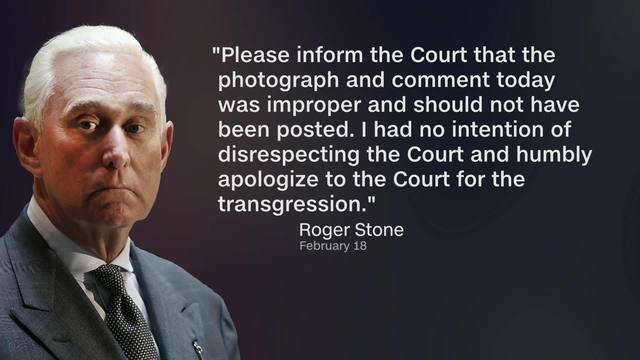 WASHINGTON (AP) - A federal judge on Tuesday ordered Roger Stone to appear in court to consider whether to revoke his bail after the Trump confidant posted a photo on Instagram of the judge with what appeared to be crosshairs of a gun. U.S. District Judge Amy Berman Jackson said Stone, a longtime Donald Trump confidant, must show for a hearing Thursday afternoon and prove why she shouldn't modify or revoke his bail or implement a full gag order in his case. Last week, Jackson issued a limited gag order, which prevents Stone from discussing his case near the courthouse and generally bars his lawyers, prosecutors and witnesses from making public comments that could "pose a substantial likelihood" of prejudicing potential jurors. But the order did not constrain Stone from making other public comments about the prosecution or his case. Stone's lawyers argued that placing any limits on his public comments would infringe on his constituently protected right to free speech.